A summer full of (camp) fun! Photo submitted by Mark Doebrich Music is one of many options for summer camp in the Marietta area this year. Students at the High School That Rock guitar camp will spend a week learning to play guitar or other instruments. 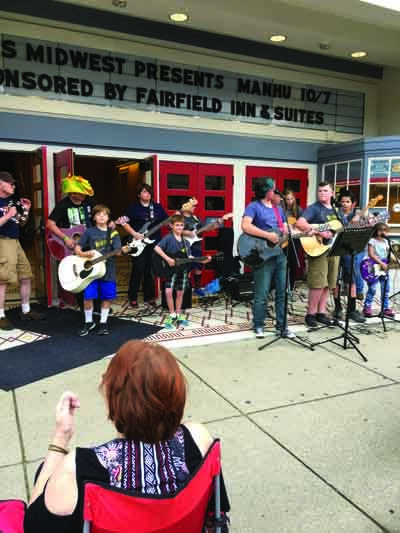 Organized summer activities for children ranging from a few days to the full summer and from arts and science to sports are on the calendar for the Marietta area. One camp that runs the full summer and has it all is the Ely Chapman Foundation Sensational Summer Camp, which runs from June 4 to Aug. 17 for ages 3 to 14. Each week is based on a different theme: fun and games, history, space, science, pirates, sports, theater and more. Carole Hinton at the foundation said parents can choose any of the weekly themes, but she recommends registering soon because there is a limit to the number of children accepted for each one. The children are divided into groups according to age, she said, and there is a state-mandated ratio for the number of children that can be assigned to each supervisory adult. Hinton said a total of 134 children were in the program last year. It has been operating since the 1990s. Marietta College education students supervise the classes, assisted by counselors-in-training who are middle and high school students, she said. The cost is a $25 registration fee plus $100 a week per child, with discounts available for more than one child from a family, she said. The fee includes breakfast, a morning snack, lunch and an afternoon snack, and some financial assistance is available subject to family income. Fine arts is the essence of the Riverside Artists Gallery weeklong camp from July 16-20. Organizer Betsy Cook, who said the camp has been operating for about 20 years, said a different teacher for each day of the camp guarantees that children will learn a wide variety of media, including acrylic and watercolor painting, sculpture and found objects, in styles ranging from abstract to realism and still life to landscape. For music, a week of instruction at the High Schools That Rock guitar camp is available for beginners to advanced, children from first to 12th grade, run by Mark Doebrich, a retired teacher and rock band musician. Doebrich said the students don’t need an instrument, loaners are available, and the registration fee of $10 before May 30 and $15 after includes a T-shirt or a set of strings. In addition to guitar, from beginning to advanced and vocal-accompaniment, instruction in a variety of other instruments, including ukulele, will be offered. Classes are held at the Unitarian Universalist Church at Third and Putnam streets. Doebrich has been offering the camp for 17 years. “Don’t let your kids sit at home during the summer,” he said. “People say there’s nothing for kids to do in Marietta, and I say, ‘untrue,'” he said. Caden Bourdon has been enrolled in Doebrich’s guitar camp for years, starting out with guitar, moving to mandoline, and he now takes percussion. Bourdon’s father, John Bourdon, said he’s a long-standing fan of the camp. The camp isn’t just a one-week gig, either, he said. The camp band plays regional festivals and events. “They actually sound pretty good,” he said. James Sandy started his son Taylor at a Marietta Family YMCA summer camp when Taylor was in preschool. He’s now 14 and in his second year of being a counselor-in-training. “He learned how to swim early. It’s interactive, they have field trips, it’s different every year,” he said. “You can get a babysitter every day, but when you’ve got something like the Y or Ely Chapman, there are other kids he can get involved with. In my opinion a child is like a sponge and needs to be around other children, not just his own age but older and younger, too. You have to deal with being around people older and younger all your life. “With the counselor-in-training program, there’s something new to do every day, it prepares you for life,” he said. The following is a list of summer camps compiled by the Times. It is not exhaustive, and other camps are available — check with your favorite organization, church or educational institution for others not listed here. – Ages of children who can register: 5-16. – The camp: Summer program, includes tennis and gardening, bullying prevention, suicide prevention, drug and alcohol awareness. – When: Ongoing, June 11 through Aug. 10. – Where: Boys and Girls Club of Washington County, 307 Lancaster St., Suite 1. – The camp: Sensational Summer Camp, theme weeks including fun and games, history, space, science, pirates, sports, theater. Breakfast and lunch included. – When: June 4-Aug. 17. – Where: Ely Chapman Foundation, 403 Scammel St.
– Registration deadline: Check with Ely Chapman Foundation. – The camp: Camp Caterpillar, pre-school readiness activities incorporated with math, science, arts and crafts, swimming twice a week and field trips to the Columbus Zoo and Amish Country. – When: June 4 – Aug. 21. – Where: Marietta Family YMCA, 300 N. Seventh St.
– Registration deadline: Continuing until full. – Cost: Sliding scale from $35 day to $125 week, depending on membership. – The camp: Camp WILD, sports, arts and crafts, hands-on activities, swimming four times a week and field trips to the Columbus Zoo and Amish Country. – Cost: Sliding scale from $30 day to $105 week, depending on membership. – The camp: Passport to Fun, activities include dissecting owl pellets, fossils, water testing, native American games and activities..
– Where: Ohio River Museum, 601 Front St.
– Registration deadline: June 11. – Cost: $100 ($90 for Friends of the Museum members). – The camp: History Camp, Early Foundations, 1800-1820s, crafts, games, tours, music, dancing and more, statehood, War of 1812, Lewis and Clark, everyday lifestyles of historic periods. – Where: The Castle, 418 Fourth St.
– Registration deadline: June 22. – The camp: Archaeology Camp, real archaeology dig under supervision of professional archaeologist Wes Clarke. – Registration deadline: July 6. – Ages: High school and adult. – The camp: Archaeology Field School, excavate a real archaeology site, process artifacts, learn about what they tell about past human activity. – When: July 30-Aug. 2 (6-8 p.m. daily). – Registration deadline: July 20. – The camp: Science and technical activities for fun, challenge and problem solving. – Where: Washington State Community College. – Registration deadline: Contact organizers. – Ages: 7 and older. – The camp: Drawing, sculpture, painting, weaving, collage, printing and more. – When: July 16-20 (10 a.m.. to noon). – Where: Riverside Artists Gallery, 219 Second St.
– Registration deadline: Check with the gallery. – The camp: A week of instruction on guitar and other assorted instruments. – When: June 11-15 (9 a.m. to noon). – Where: Unitarian Universalist Church, Third and Putnam streets. – Registration deadline: Continue until filled. – Cost: $10 before May 30, $15 afterward. – Contact: Mark Doebrich, 740-336-4183. – The camp: Drills and fundamentals needed to become a complete baseball player. – Where: Don Schaly Stadium. – Registration deadline: Check with the organizers. – Ages: Grades 3-12 (three age divisions). – The camp: Fundamentals of volleyball, beginner through advanced. – Where: Marietta High School. – Registration deadline: Contact organizer. – Cost: $30 grades 3-5; $65 grades 6-12. – Contact: Ron Kidder, 740-336-1722.